Making the best decisions around infrastructure development investment is all about sound analysis of your available options. This section covers the various infrastructure types, the benefits and limitations for each along with specific design considerations. It also looks at on farm case studies where actual Australian dairy farmers talk about their experience of infrastructure investment. No matter if your proposed investment is big or small, it is important that your eventual design takes into account of these multiple factors. Which Development is Right for You? Use this handy online tool to find out which infrastructure facility best suits your needs. Just answer some simple questions to see a list ordered by most suitable. This type of feed pad is used for regular supplementary feeding of cows on an area of land that is either formed with a solid foundation and/or concreted to establish a permanent facility. A fully covered facility with a concrete slatted floor that covers an effluent holding bunker. The bunker is made of concrete and is large enough to hold or store effluent for extended periods. This is a fully covered facility, usually built with plastic film over a framed roof. The base is a soft bedding material such as straw, sawdust or woodchips, capable of absorbing some effluent. 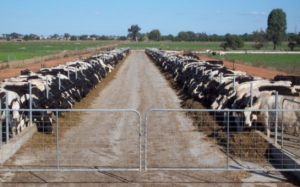 Compost bedded pack is an alternative loose floor system or approach for dairy housing facilities that is typically suited to warmer and dryer climates. The set up often utilises centralised cow alleys and feed alleys. These are permanent, engineered structures in which dairy cows are housed and usually provided with their daily feed requirements and water. They may be open air, partially or fully enclosed.